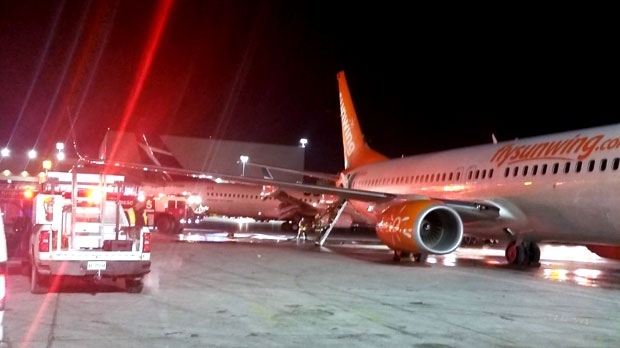 The Transportation Safety Board of Canada says there was a lack of ground personnel when a Sunwing plane clipped a WestJet plane at Toronto’s Pearson International Airport in January, sparking a fire. The WestJet flight, with 169 passengers and six crew members on board, had just arrived from Cancun on January 5 when it was struck by a Sunwing aircraft which was being moved by a tow vehicle. The wing of the WestJet plane burst into flames, prompting an evacuation. The Sunwing plane had no passengers on board. The TSB investigation found that wing walkers, who are ground personnel positioned near the wings of a plane to make sure the surrounding area is clear, were not used during the pushback of the Sunwing plane, in violation of Greater Toronto Airports Authority and Sunwing requirements. Swissport, the company that manages ground crew operations at the airport, including tow vehicle operators, also has these requirements, but the TSB report found that the general practice was to only use wing walkers when passengers are on board. The report also found that the plane evacuation process was hampered by a number of WestJet passengers retrieving their carry-on baggage before they left the plane, against instructions from the flight crew. No serious injuries were reported in the incident.